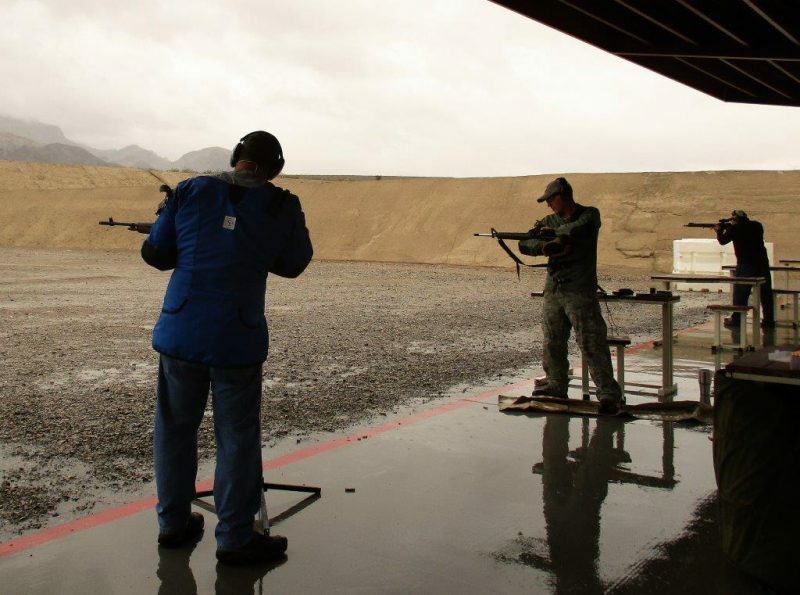 On a cold, wet and blustery morning, five shooters braved the elements at Clark County Shooting Complex to shoot the Civilian Marksmanship Program’s National Match service rifle event (short course). Ok, I exaggerate somewhat… We’re in the Mojave desert so it wasn’t that cold, had a covered shooting bay so it couldn’t be that wet, and enjoyed climate controlled facilities with full plumbing to retreat to for breaks. But nonetheless, it was down in the low 40s with a wind gusting to 20 knots blowing rain directly into us, despite the overhang. While not ideal conditions we had a great time at the CCSC. Shooters fire the National Match standing stage. It was wet! This event was a formally sanctioned CMP match (non-EIC) and we were very happy to have the support of the NV Firearms Coalition’s competitions division director. We started with about 45 minutes of open range time to confirm zeroes and warmup. After the safety brief, we were off! The National Match short-course uses scaled targets placed at 100 yards to represent targets that would be placed out at further ranges at a full-distance “across the course” event. While you don’t have to deal with ballistics, the targets are still fairly small. Of note, for 2017, the CMP has released score cutoffs for various classifications. To qualify as a “sharpshooter” an average score of 85% is required. To give an idea of the type of shooting required to meet the CMP standard, we’ve given the target size in MOA (inches at 100 yards) that you need to hit in each stage. Stage one (SF Standing): 10 shots, standing, slow fire in 10 minutes. CMP’s “sharpshooter” standard is about 8 MOA. Stage two (RF Sitting): 10 shots, standing to kneeling/sitting with a reload, rapid fire in 60 seconds. CMP’s “sharpshooter” standard is about 8 MOA. Stage three (RF Prone): 10 shots, standing to prone with a reload, rapid fire in 70 seconds. CMP’s “sharpshooter” standard is about 5 MOA. Stage four (SF Prone): 20 shots, prone, slow fire in 20 minutes. CMP’s “sharpshooter” standard is about 3 MOA. All shooting is unsupported, with no bipods, rests, rucksacks or other support other than a sling. 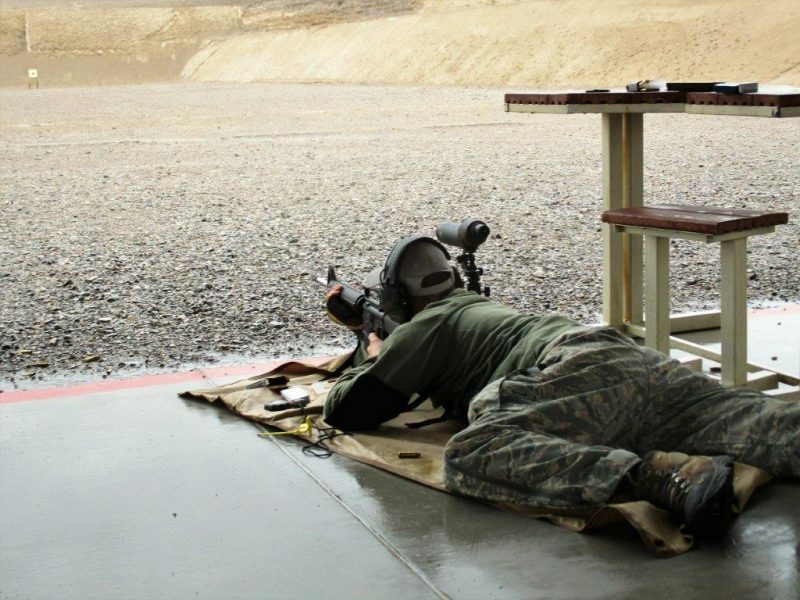 A Revere’s Riders instructor fires the National Match short course rapid fire prone stage. Luckily, the wind was pretty much straight in our faces so it was not a huge factor despite gusts up to 20 MPH. The rain on the other hand did cause some problems. Optics and spotting scopes were fogged and covered in water drops, shooting glasses got water beads at inopportune moments, and a few mags got slippery and tough to keep ahold of. The table summarizes results of the match. Score cards will be sent to CMP next week. Thanks to everyone for coming out and joining us! James shot very well — despite being technically classed as a “match” rifle, he shot a pretty standard AR-15 with aftermarket grip & rail using ball ammo, not a fancy race gun. It was very motivating to hear Mark’s M1A thumping away with 30-cal authority on the line. Dann and Danny were both working out the kinks at their first-ever match but learned a ton. We are particularly grateful to Johnny from NVFAC for joining us. We are hoping to continue to partner with NVFAC to bring formal competitive opportunities to the Clark County Shooting Complex. His support as an RSO kept the event safe and efficient. We are also thankful to the Boulder City Rifle/Pistol Club High Power shooters for helping us put out the word about this event. We encourage all service rifle shooters to join the Boulder crew for full-distance “across the course” shooting opportunities. 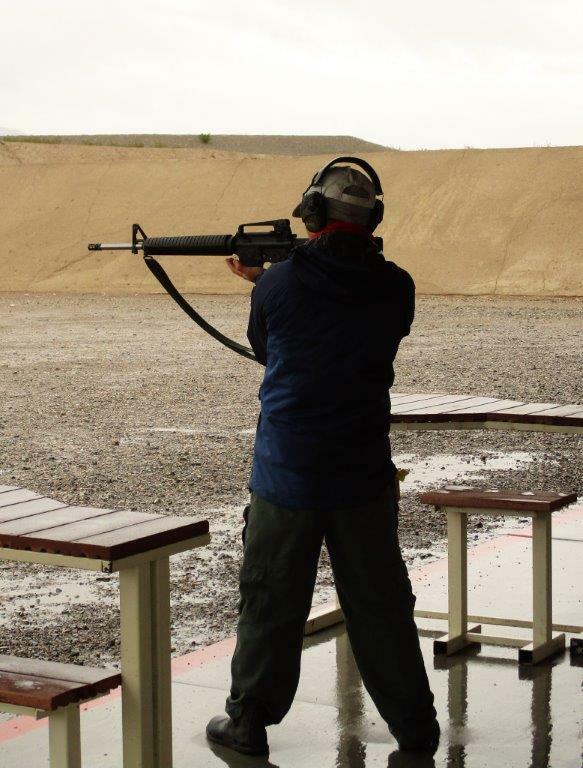 Regrettably, due to the weather, everyone decided to skip the NRA AR challenge carbine portion. That would have required us to be out in the worst of the rain. We did use the last of the range time effectively for Morgan’s Challenge, and James shacked the target with a solid single-shot hit, earning a Morgan’s Rifles patch! Congratulations! We hope to run a quarterly formal match with a focus on service rifle, rimfire sporter, and NRA AR challenge events at the CCSP. Our next event is scheduled for May 21, and we hope to see you there! 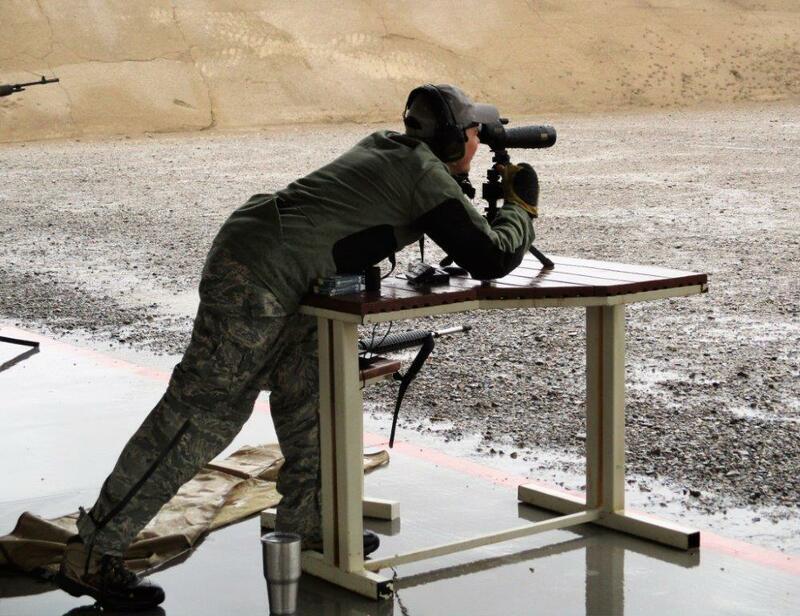 A competitor fires the National Match short course rapid fire prone stage. Shooters fire the National Match standing stage. A competitor checks hit locations before dialing a minor sight adjustment.